The New Miele Ranges Are Here! The last installment of Mielevember comes to us on December 1st, and I’ve been saving the best for last. Ever since I’ve been in the appliance business, rumors swirled about Miele coming out with a range. Every time I asked Miele about it they kept telling me, “Shut up, Kieffer’s Guy. It’s coming, just be patient”. You’d think patience would be a virtue of mine considering I’m a Philadelphia sports fan and championships are few and far between; my goodness the Phillies championship in 2008 seems like forever ago. Anyway, back to appliances. The time has come and Miele is now ready to release their ranges into the appliance world! Let’s check out some images and learn all about them. Just like other manufacturers of pro-style ranges, Miele categorizes their models by widths. 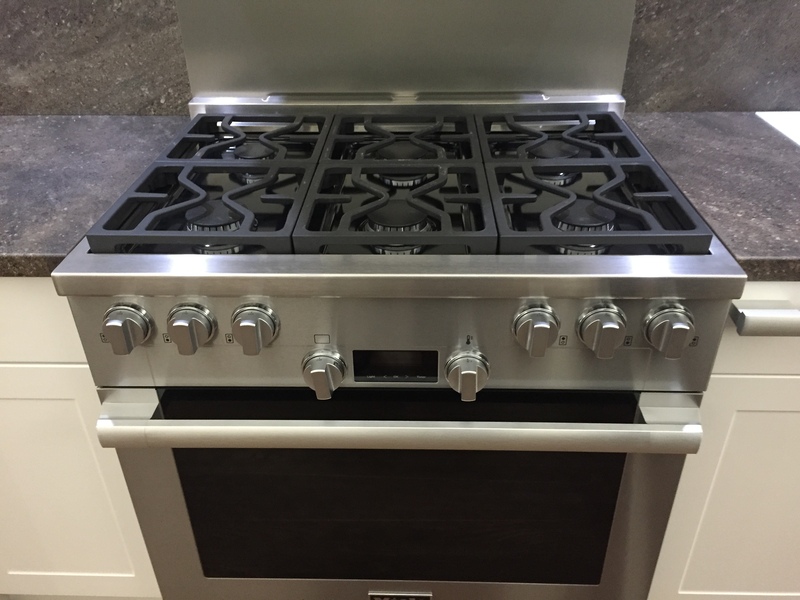 Induction and electric ranges are available in 30-inch sizes while gas models are available in 30- and 36-inch sizes. Dual-fuel models (gas cooking surface with an electric oven) are available in 30-, 36- and 48-inch widths. If choosing a range 36-inches or larger, you can select a burner configuration with a griddle or a grill. Another range on display at Miele’s HQ. This is a 36-inch model. Attractiveness aside, Miele’s main goal with their ranges was to pack an abundant array of cooking options backed with powerful performance. Every gas or dual-fuel range features one 12,000 BTU burner (48-inch ranges feature two) while the remaining ones are rated at 19,500 BTU making them some of the most powerful sealed burners available. All burners feature a double-stacked design to provide maximum flame coverage for raging boils or minimal temperatures for gentle simmering. While the burners tackle any surface cooking needs, the true celebrity in the design of Miele’s ranges are the ovens. Unlike other pro-style range manufacturers, Miele’s all gas ranges are self-cleaning. Two convection fans stand ready for convection broil and bake modes, and non-convection modes include speed heat, rapid PreHeat, broil, and bake. Ovens in their dual-fuel, electric, and induction models raise the bar even higher by featuring all of the M Touch built-in oven characteristics including 21 different operating modes in an easy-to-use touch screen. The MasterChef program, which takes the guess work out of cooking, is the centerpiece of the oven functionality. With MasterChef, users interface with over 100 different automatic cooking modes including cycles for casseroles, cakes, cookies, and vegetables. Roasts and other meats always cook to perfection with the use of Miele’s wireless roast probe. This is a dramatic departure from competitors that still adopt the plug and play functionality to operate their probes. On top of the robust features of the ovens, each dual-fuel, electric, and induction range connects to a water line which provides steam bursts for keeping keeping foods moist during cooking. This control board flattens when not in use. Available on electric, induction, and dual-fuel models. 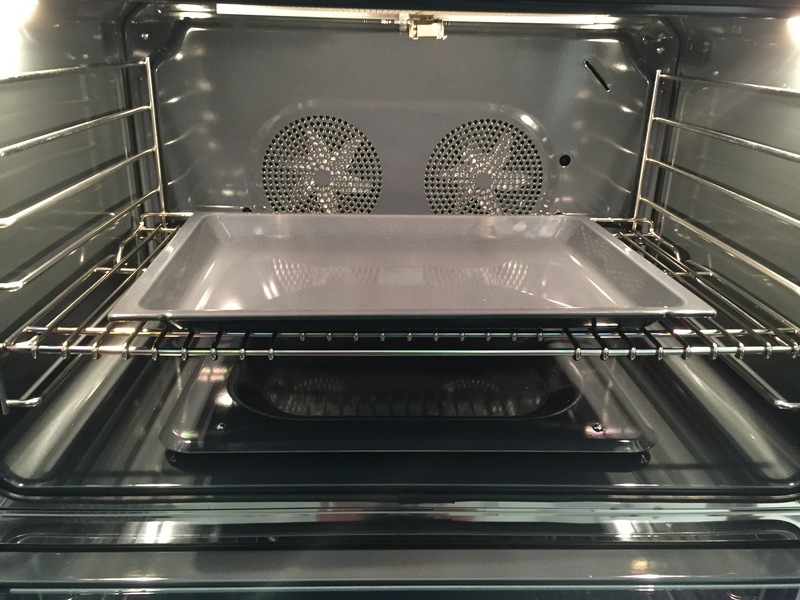 Not one, but two convection fans in a Miele Range Oven. The crowning achievement within Miele’s range lineup is their 48-inch range. Available in dual-fuel only, the 48-inch unit comes with eight M Pro Burners, or six burners and a grill or griddle. Below, a full-size oven with all of the M Touch oven specifications is ready to fit the largest turkey. Unlike other 48-inch ranges that have a companion oven in addition to the main oven, Miele’s 48-inch range includes a fully functioning speed oven (an appliance that functions as a microwave and a convection oven) with a warming drawer below. Rivaling some of the most advanced ranges on the planet, the Miele 48-inch range can microwave, bake, boil, and keep foods warm at the same time. Pretty impressive. The oven on the left is a speed oven with a separate warming drawer below it. To the right of the speed oven, is a main convection oven. We just had contractors from Miele visit our showroom to prepare our Miele display to house a 30-inch and a 48-inch range. These models will be on display shortly, so make sure to “like” our Facebook page for the announcement plus our sales staff is here to answer all of the questions you might have about Miele’s new ranges. Until next time, America!